Today I attended my second meeting of the “East Midlands Road Users and Environment Committee” of the Highways Agency (HA) in Leicester on behalf of Derby Cycling Group. This is a way that the Highways Agency, that oversees the trunk road network, liaises with non-motorised users of its network – including cyclists, pedestrians and horse-riders. Today’s meeting included a briefing on the way they judge whether improvements meet their aims, which is done by consultants to give some independence to the assessment. We also had an update from one of the HA’s traffic officers. These patrol the network responding to issues causing delays with the aim of keeping traffic moving. They work closely with the police, who lead on more serious incidents. A number of other issues were raised, including operational issues like litter-picking, and environmental ones like air quality and noise. They had appreciated the award we’d given them for their good management of cycle routes during the Alvaston bypass construction works! There was quite a lot of discussion on the A52 going into Nottingham – more on this on my website – and we also had a discussion on the consultation being planned for raising the motorway speed limit to 80mph. Aimed at all schools in the UK, The Big Pedal is back and this time it promises to be bigger and better than ever before. The organisers have made some improvements to the race – including the participation of scooters! The race is open to every school in the UK and takes place between 5-23 March 2012. It’s completely free to enter and there are some brilliant prizes up for grabs. 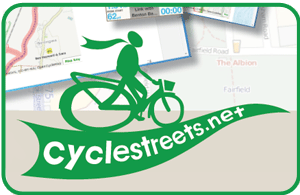 The Liveable Streets website (based in the US) contains a lot of videos including one on the recent Suffragettes and Cycling event in Leicester. Trent Barton Red Arrow driver informed me that folded cycles would only be allowed inside the coach if enclosed in a bag. Generally I’m happy to store the bike in the lockers underneath the coaches but Derby bus station now has barriers preventing access to the lockers and some of the Red Arrow coaches have dangerous lockers which cannot be used (and which have been broken for months!). Further discussion with Trent Barton has not resulted in any definitive policy. In general, I see a general trend from the bus companies in trying to find reasons not to allow the folded cycles onto their services rather than actively trying to encourage more passengers to combine the use of cycles and buses. I hope to see this trend reverse in the near future. One tip for Brompton users is that the IKEA large blue plastic/fabric bag (cost of 40p each from the checkouts) is large enough to place a folded Brompton into. I should say that, apart from the recent incident with the Red Arrow, I have found Trent Barton to be very accomodating to me and my folded cycle and hope they can continue this excellent attitude. A Department of Transport document exists here which gives a lot of guidance on how cycle facilities should be provided. A great way to engage in local democracy and have an influence. Go and argue the case for cycling at a local level. Even better get on the board for your ward, they have money to spend on local facilities for local people!! If you are able to represent the DCG at any forums then please let the Campaigns Co-ordinator know. I will be meeting East Midlands Trains at their Conference on Friday, 4 November 2011. Short notice, I know, but if anyone has views on the service East Midlands Trains provide for cyclists then please add your comments below and I will take them to the meeting. 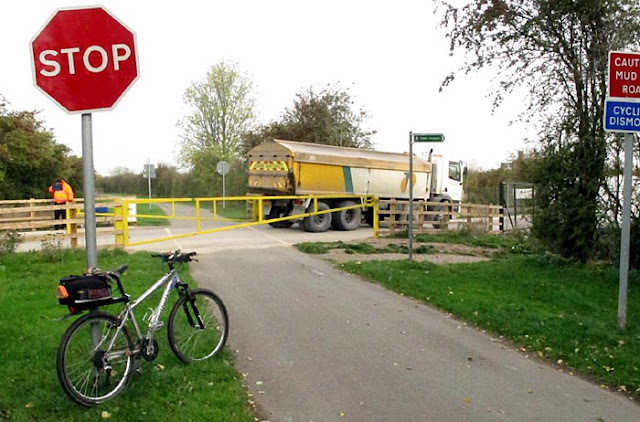 At Shelton Lock a new school is being built, and an access road has been constructed crossing the nearby Cycle Path. Jubilee Road to the left. There is a man controlling the gate, which prohibits the passage of pedestrians and cycles when there is motor traffic on the access road. The gate is left open outside working hours. Completion of the school is due in September 2012 and both the gate and the access road will then be removed. The government have published a document detailing a new policy for traffic signs (93 pages of bedtime reading!). There is some interesting content regarding cycling including the approval of the contraflow cycling sign (for allowing cycling the wrong way down one way streets).